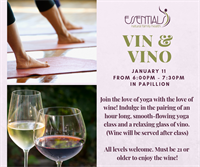 Indulge in the pairing of an hour long, smooth-flowing yoga class and a relaxing glass of vino. (Wine will be served after class). All levels welcome. Must be 21 or older to enjoy the wine! The class is $15. Limited spots available.